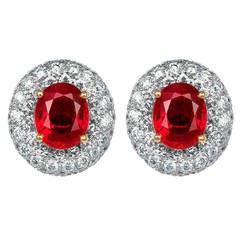 Stunning natural deep red ruby earring studs. Very rare and fine Ruby pair. Deep red colour, both individually certified by IGI Antwerp as natural and Burmese in origin. Burmese/Myanmar rubies need no introduction. For centuries they have been regarded as the best quality and most scarce of red stones. 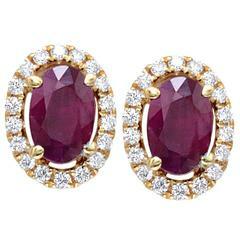 The rubies both have a stunning deep red colour and an excellent round cut. Perfect matching pair, very hard to match rubies like this as each stone is so unique. Fine ruby jewellery pieces like this demand very high prices. Only standard heated like nearly all sapphires and rubies on the market, no diffusion or other treatment. The earrings are brand new and never worn. A unique piece. All our jewellery is posted safely and securely in exquisite leatherette boxes.